April 19, 2019 By Allyson 59 Comments This post may contain affiliate links. Read my disclosure policy. Pear Salad is a classic southern comfort food! 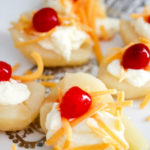 These canned pears topped with mayonnaise, cheese, and a cherry will be a hit at the next potluck! I know what you are thinking, pear salad?! Trust me, growing up in Michigan I’d never heard of pear salad. However, now that I live in Georgia, I hear about it ALL THE TIME. It’s kind of crazy in my honest opinion, but it’s one of those things you just can’t knock it ’til you’ve tried it. So, have you tried pear salad? Pear Salad is simple because it only has 3 ingredients, four if you want to get fancy. Canned pears, mayonnaise, and shredded cheddar cheese. 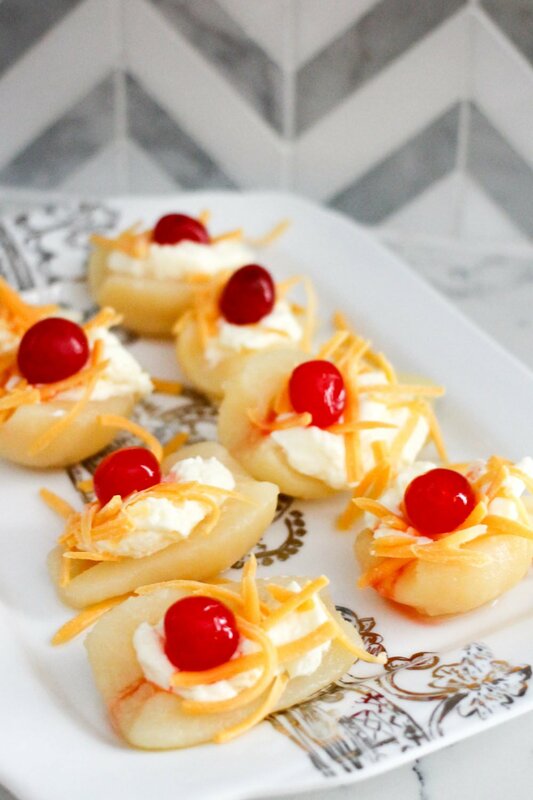 If you want to sweeten things up, add some maraschino cherries on top! 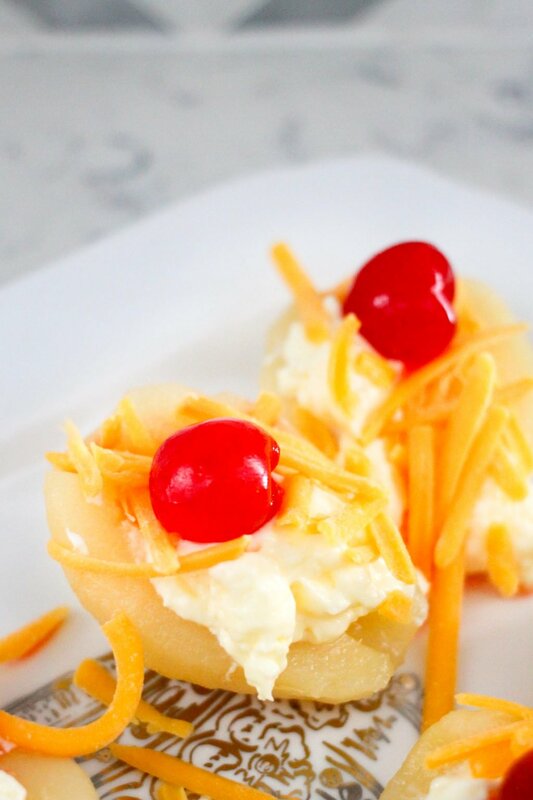 Place the pears center side up, then scoop some mayo on top (my southern friend demands Blue Plate, however her southern friend says Duke’s…), then add the shredded cheddar cheese and pop a cherry on top! Some people also like to serve it over a bed of ice burg lettuce- YUM! This is a fruit salad with pears, mayonnaise, and cheese. Some people like to serve it with a cherry on top or over a bed of lettuce. Its origins aren’t completely known, but we do know it started in the south. I have heard from many southerners that they grew up with it served in their school cafeteria, and many stories about people’s grannies bringing it to events, or serving it every Sunday. Every story I hear about pear salad has comforting thoughts of childhood and growing up around family! Pear Salad is Low Cost! Not only is this easy to make and super delicious, but it’s also cheap! It’s about $1 for a can of pears, probably .50 cents worth of mayo for the whole can of pears, and maybe .75 worth of cheese! Can’t get much cheaper for a quick and easy side dish! I highly suggest you take this pear salad to your next potluck or get together. Even if you don’t live in the south, this will be a HUGE conversation starter and it will be interesting who actually tries it! Make sure you tell them, don’t knock it until you try it! Having a holiday party?! 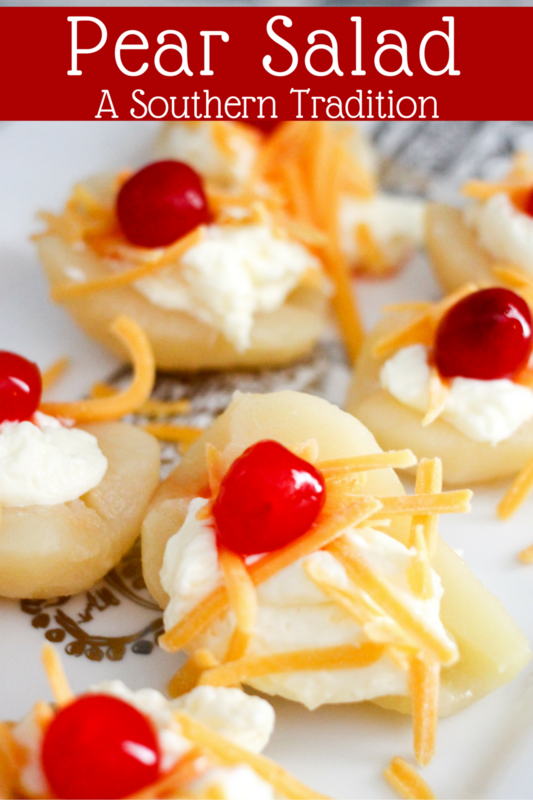 No party is complete without the pear salad served up with the other appetizers. Try serving it alongside some Cranberry Baked Brie. Pear salad is perfect for any potluck! Whip it up, throw it in a storage container, and then pop it in the fridge until party time. It’s even good if you make it the night before! Couples game night?! Serve it while playing your favorite games such as Cards Against Humanity or Catchphrase! Sunday dinner! Pass this salad around with dinner and everyone will be blown away! Pear Salad is a classic southern comfort food! Don't knock it until you try it; with only four ingredients so you can whip it up in no time! Place drained pear halved center side up on a serving dish. Add about 1 TBS mayo to the center of each pear half. Then sprinkle cheddar cheese over the top. Top with maraschino cherries if desired! When not eating, keep refrigerated. Can be made night before and stored covered in the refrigerator. Well I don’t ave any southern roots but I have been making this all my married life(64years)! I use cottage cheese though. Wow!!! That is amazing and CONGRATS on such an amazing marriage!!! So do I, and I’ve lived all my life in the south! I make this using cottage cheese , not mayo . My husband and I ( 53 years ) like it best that way . But we’ve never tried the pears with a cherry on top . Only shredded cheese and a little juice from the pears . I love both the mayo (Dukes) and cottage cheese. My mom used MW too, and always put each pear on a lettuce leaf. Really colorful and so refreshing! Ok, this is one I’ve never heard of! I love pears so it sounds like I need to give this a try. Also very good with pineapple slices. This is a new one for me! I’ve never heard of this dish. I’ll have to give it a try. Try it and let me know how you like it!!! Looks so delicious! I love the flavor combo! Happy to hear you would give it a try! What is the correct mayo? I say BLUE PLATE, but a lot of people also like DUKES! We don’t have those brands of mayo in the Midwest. I like Hellman’s mayo but any good mayo will do. Never heard of this southern dish. Will have to give it a try! I have had it with softened cream cheese. Easy and good tasting. Oh good substitution!!! Love that! Oh good tips! I am not a fan of miracle whip, but paprika sounds good! These are the most creative thing I have seen today! I love it! It really is good. I’ve eaten this about all of my life. I’m 62 years old. I am so happy to hear that! Do you ever try it any other ways? I’ve never heard of this but now I feel like I HAVE to try it! We ate it all three ways. Mayo, cottage cheese and cream cheese depending what mom had in the fridge. (55 yrs ago) also had it with pineapple instead if pears. Also made one out of Bananas with mayo and peanut butter and crushed peanuts. All were served on a lettuce leave. Thanks for the memory.! I grew up on these, too! Long time since I’ve had it but tonight sounds like a a great night!l. Thanks for the memories! Georgia girl all my life! My aunt would make this many years ago. She mixed cream cheese and crushed Fritos for the filling. Thanks for jogging my memory! Have eaten this all my life also. Always served on a bed of lettuce. Canned peach halves are also good, but prefer cottage cheese with them. I will have to try it with the peaches! Have you tried this pineapple salad? Place a pineapple ring on a leaf of lettuce. Place a spoonful of pimento cheese in the center of the ring and (optional) add a cherry on top. It’s delish. I wonder if instead of mayo and cheese, try placing a spoonful of pimento cheese in the pear? I haven’t tried that, but a lot of people have said that they change out the pear for pineapple in this pear salad recipe, so I would say it’s worth a try, especially if you know you already like it! Let me know how it goes! Grew up on the pear & pineapple with Blue Plate mayo. Always had a lettuce leaf underneath them. Delish!! Georgia girl all my life! Ok…stupid question…do you slice it with a knire and eat little cross-sectionw or do you pick it up? I like to cut mine up, but I know a lot of people who just pick it up! Can you use yogurt instead of mayo? My brother is allergic to mayo. Sure! I have heard of people using cottage cheese too! two rasins for eyes a cherry nose and Cheese hair and you have a clown! This takes me back to my childhood. I was born and raised in South Georgia and my mom made this at least weekly. She would put her pears on a lettuce leaf on individual small plates. I have to say I never cared for it as a kid and haven’t had it as an adult lol. I may have to revisit it to see what I think of it now. Thanks for nthis great throwback recipe from my southern childhood. So many great memories around Pear Salad! It’s a dish that brings everyone together for sure! My mom made this all the time except she used shredded carrots and cheese with the mayo. I actually made these tonight. Always brings back wonderful memories of growing up. 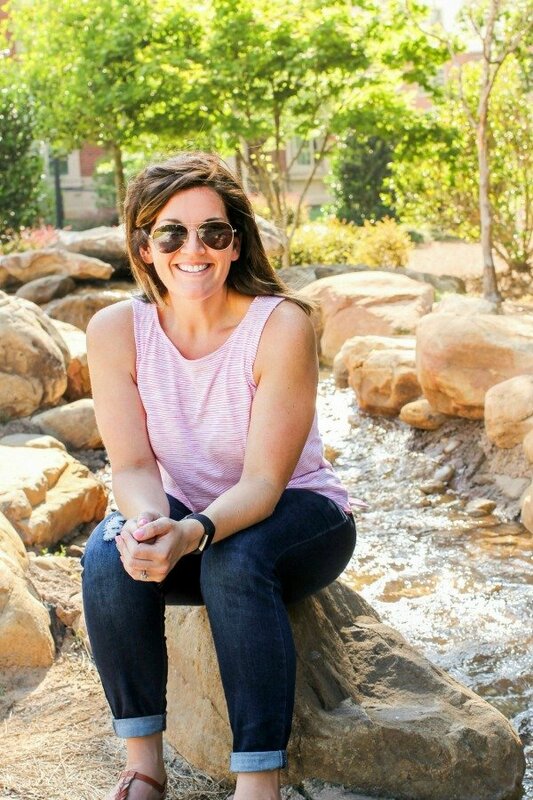 My mom was from Georgia. I have to say, I’m southern and I’ve never seen or heard of this before! Looks absolutely delicious! My mom from SC used to make a salad of sliced banana on a small bed of lettuce topped with mayo and chopped peanuts. I loved it. I have tried to make it but it never tastes as good as my mom’s! Such an incredible dessert!! Can’t wait to try this recipe! Love how easy and tasty these treats are! Looks like the perfect appetizer! What a quick and tasty dish! I don’t usually make many meals with pears, but this sounds deliciously sweet not to try! These look delicious, I will be making these soon! I need to give these a try! Sounds yummy! Love the use of pear! I have to make these for our next gathering!